What KPIs are other agency owners tracking? What should my profit margin be? How many clients do I need to make $X per year? What sources generate the best leads? These are just a few of the common questions agency owners and leaders ask themselves. Leading an agency is a challenging pursuit -- it's a different type of business with its own set of rules, language, and best practices. 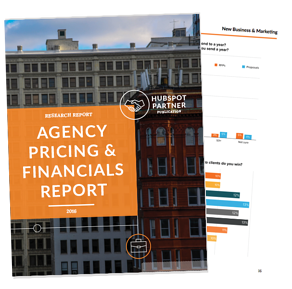 To help agencies better understand how to price, manage, sell, market, and deliver to clients, HubSpot conducted a survey with more than 750 agency executives responding to our questions. This data, along with industry expertise from Tim Williams, Karl Sakas, Jason Swenk, Drew McLellan, Peter Levitan, and Lee McKnight, Jr., was combined in our first agency-focused research report: The Agency Pricing & Financials Report. Simply fill out the form, and download the report to better understand how to build a profitable and stable agency.